We get a lot of questions about Schlage oil rubbed bronze vs. aged bronze. At first we had a ton of orders for Oil rubbed bronze but many customers were returning them because they didn’t match up to what they already had in their home. So we changed the wording on our website to explain the differences. Then a lot more people started ordering the Aged Bronze and our number of retuerns went down quite a bit. Truthfully, the oil rubbed might have been just what they needed to match up with what they have but it looks different new than it does after someone has had it for a while. So in hopes to further clarify the difference between these two finishes, I decided to write this blog post. Schlage Oil Rubbed Bronze: Out of the box Schlage’s oil rubbed bronze looks like a poweder coat or painted brown finish. It has kind of a flat paint texture. The oil rubbed bronze finish is designed to age. Over time the more you use the knob, more of the base material will show through giving the hardware a neat, worn patina. In many cases when people have ordered hardware to match what they already had, there is a good chance they did have oil rubbed bronze, it was just worn because they had had it for some time. 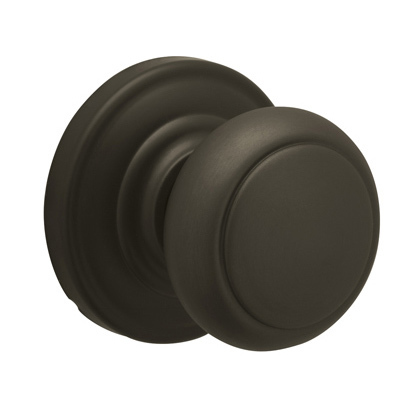 An older oil rubbed bronze knob and a brand new one will look different. Schlage Aged Bronze: This finish looks very similar to many oil rubbed bronzes of other brands, but it doesn’t change over time. Out of the box Schlage’s Aged bronze is a little darker than their oil rubbed and the knob itself has more of a satin, somewhat glossy finish and has reddish highlights showing through. In summary, if you are trying to match some Schlage products to say, Weslock, Emtek or Kwikset‘s Oil Rubbed Bronze, Aged bronze will be the closest match right out of the box. However, these other brand’s finishes will wear over time too whereas the aged bronze would not. 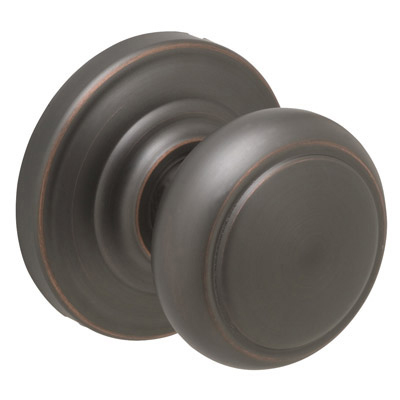 If you really wanted the worn look that will vary from one knob to the next, giving you that unique patina on each one… Schlage’s oil rubbed might be the better choice.